Tougher screening of passengers wanting to fly to the US has been condemned as unfair by Nigeria - one of the nations singled out for special checks. Information Minister Dora Akunyili said the rules, brought in after a Nigerian man allegedly tried to blow up a plane, discriminated against 150m Nigerians. Bomb suspect Umar Farouk Abdulmutallab did not represent Nigeria, she said. Nigerians are among 14 nations whose nationals face stiffer rules including body searches and luggage checks. Four other African countries - Algeria, Libya, Somalia and Sudan - are also subject to the new measures. It follows an alleged attempt to blow up a plane on Christmas Day. US President Barack Obama has been under pressure to make visible security improvements. But Ms Akunyili said 23-year-old Mr Abdulmutallab's act was a "one-off". "Abdulmutallab's behaviour is not reflective of Nigeria and should therefore not be used as a yardstick to judge all Nigerians," she said. "He was not influenced in Nigeria, he was not recruited or trained in Nigeria, he was not supported whatsoever in Nigeria. "It is unfair to discriminate against 150 million people because of the behaviour of one person." 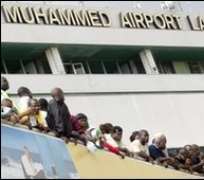 The BBC's Fidelis Mbah in Lagos says queues of people waiting to check in were longer than usual at the Murtala Muhammed International Airport on Monday after the new security directives came into effect. He says extra officials had been deployed to search luggage and frisk passengers. Nigeria has already said it has tightened its security measures since the alleged Christmas Day plot. Security agents prevented our reporter from speaking to people in the queues.